Author and spiritual teacher, Wayne Dyer often shares his insights on the ancient wisdom of the Tao Te Ching by Lao Tzu. One teaching which struck me like a lightening bolt was that, “there’s a time for everything.” Whenever life reaches a point where things seem to slow down or we feel there’s no significant progress being made in certain areas, we feel stagnant and start to feel bad about ourselves. If we’re not busy enough, or the relationship isn’t working out, or we’re not accomplishing many goals at once…we deem ourselves boring, useless or a failure. This is when it’s imperative to remember that there’s a time for everything and everything happens at the right time. Trying to control leads to ruin. Trying to grasp, we lose. Allow your life to unfold naturally. Know that it too is a vessel of perfection. and a time for being in danger. and resides at the centre of the circle. Accepting that we’re not always going to be on a high and that low tides are a normal part of life sounds easy in theory but when we’re in the midst of a less favourable season we judge it and do everything we can to change it. Instead of letting go and practising patience, we struggle and yearn for life to be different. Whenever I find myself complaining about what-is or obsessing over things ‘not working out’ I bring myself to the present moment and remind myself that, “there’s a time for everything.” By releasing my judgements on whatever the life circumstance is, I allow room for peace to enter my mind and heart. Please note that surrendering to what-is does not mean resignation or complacency. Surrendering to what-is allows one to remember that this too shall pass. We feel great when everything in life is going our way, things are magically falling into place and we’re encountering success after success. However these seasons can be so alluring that we become attached and wish for them to never end. As a result, when our world slows down, life just isn’t good enough anymore. Each season serves a purpose and so to deny one season and only accept another is futile. It’s become the norm to place expectations on ourselves and our lives wherein a season of harvest means you’re worthy and successful and a season of solitude or peace is mistaken for being a waste of time or a sign of laziness. Do we curse the Earth for slowing down in Winter? No, we know it’s a natural part of the Earth’s climate and it’s inevitable. Instead, we prepare for it and make the most of it whilst knowing there’ll be Spring again. When one learns to respect the impermanence of life and receives each season with open arms, there’s room for serenity and clarity. Instead of being afraid or attacking what-is, we remember that everything is temporary and nothing lasts forever; not even the so-called ‘bad’ times. Cycles on Earth are natural and necessary; they restore balance and regulate the atmosphere. So next time we find ourselves in a season we don’t like, let’s not judge ourselves. Let’s remember that there’s a time for everything and this too shall pass. Overthinking will never provide the clarity we desire since that’s what got us feeling so crap in the first place! It’s a vicious circle as we start to observe our life, think about what we’re unhappy with, go down an endless pit of over-analysing the problems in the hopes to find a solution, realise we’re creating problems that we didn’t even notice before, start to overthink every aspect of life as if we need to fix it (when in fact life is never ‘broken’ or something that needs ‘fixing’), then we’ll notice we’re overthinking everything and so worry about that, and then stress ourselves out trying to stop overthinking and so on it goes. Yes we all have goals we’re working towards, yes we each want to fulfill our potential as an individual, yes we want to live the best life possible however feeling sorry for yourself or putting so much pressure on yourself to obtain those achievements will not and does not work. Those thoughts and feeling only cause more grief and so solace seems even further away. Our ego-mind believes that peace, self worth and fulfilment is elsewhere; it’s anywhere but here. Thoughts such as “I will feel good enough when I have that dream job” or “I will feel loved when I have the perfect relationship” are filled with insecurity and they’re fixated on outer events as if those events will give us salvation from the inner turmoil we feel. Not only do we become attached to the outer world but we start to base our identity on it as if having a lot to show for yourself makes you a better person. Yet it’s when we’re going with the flow of life and doing what makes us happy without overthinking that we have all of the energy and inspiration we want to naturally become the amazing person we’re striving way too hard to be. Detach yourself from your overthinking and from looking to your outer world to find the feelings of peace and worthiness you so truly want and which are already ever-present. “But if I just accept my life as it is when I now see there are so many things I’m unhappy with, I need to think about them in order to make a change” is the next thought that may appear. There’s a false belief that by accepting and surrendering to the present moment and life circumstances we will not elicit any change, as if appreciating what-is will make us complacent, yet life is ever-changing. It is this resistance to the present moment which creates suffering and as a result makes us feel like we’re stuck in a rut. I can look back on my life at moments where I could say my life wasn’t ‘perfect’ and I wasn’t where I wanted to be in certain areas yet I still got to where I needed to be and it wasn’t by overthinking; it was by enjoying my life as-is which in turn allowed room for grace and for events to effortlessly fall into place. My overthinking could not have come up with or strategised the ways I entered my desired career, the relationships that grew stronger or any events which have brought me true fulfilment and wonder. Our minds are wired for survival and so will naturally look for problems to solve and things to change but try not let yourself go down that dark road of overthinking. Remove yourself from those worrisome thoughts and take away their power by accepting that they’ll occur. Befriend those thoughts and your mind by giving them thanks for caring about you and your life so much! Then leave it at that and remind yourself as much as possible that you are already an amazing human being who doesn’t need to strive so hard to be happy or work so hard to prove yourself. Whether life is too busy or too boring, it’s easy to get caught up in constantly trying to achieve ‘the perfect moment’ but therein lies the problem; trying to achieve something that’s already ever present. Our minds are dominated by this time-space reality and so instead of letting each moment be, the limited ego-mind often tries to define or capture the moment. This can be seen in situations wherein we find ourselves looking back or forward and wishing we were experiencing ‘that moment’ and so completely depreciating the here and now. This can also happen whilst experiencing a moment of bliss and then letting worrisome thoughts such as, “This moment isn’t going to last forever” tarnish what was so pure and beautiful. Clocks and calendars are great tools for organisation, staying on schedule and for planning fun events. However where’s the line between being organised and being too rigid? If we’re too busy living every day on a schedule or too bored to appreciate the moment, there’s no room in our minds to let life’s magic and mystery in. There’s also an assumption that only happy moments are worth appreciating or chasing however without the variety of emotions and feelings we have, life would be mundane. There would be no room for growth or nothing to trigger change. Our happy days give us fond memories, and our sad days can be our biggest teachers. Next time you find yourself stressing over time or yearning for tomorrow, remember that the Universe is limitless and there will always be magical moments to experience. Let go of trying to make ‘the perfect moment’ happen and choose to let today be. Feeling loved and enjoying life comes from being authentic, not perfect. That’s the lesson I’ve learned this Summer. Now I hate to admit that I have any fears or weaknesses but this time I finally faced up to the fact that my biggest fear is rejection. While I’m a confident, independent and happy woman, the belief I held was that rejection equals failure which equals ‘not good enough’. 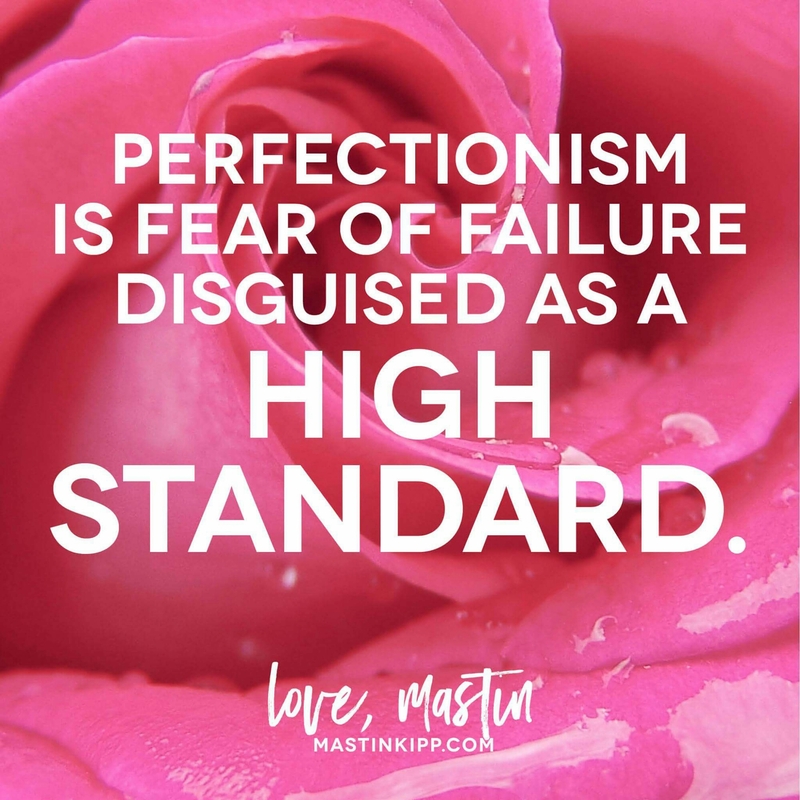 So in order to prevent rejection, I adopted high standards which were actually perfectionism. Attaining perfection is tiresome as the idea of ‘perfect’ is an illusion, it’s subjective, and forever elusive. I realised that I was so fixated on being “the perfect girl” in order to avoid rejection because I believed that if I ticked all of the boxes, I could never be rejected. Yet I wasn’t getting the full love and acceptance I desired in romance. That was because I had been rejecting myself all along without even realising it. The high standards I had placed on myself were conditions; conditions I had to fulfill in order to feel good enough. This included everyday thoughts which would go unnoticed such as, “I’ll feel 100% good about myself once I’ve had my hair done” or, “Next week I’ll feel better once I’ve cut out the junk food.” No, the time to feel good and love yourself unconditionally is now. I now understand how important authenticity and unconditional self approval is. Without them, we will unknowingly seek approval outside of ourselves and latch onto it once someone gives us the acceptance we’ve denied ourselves. This happens without realising as the lack of fulfilment and connectedness is masked with egoic ‘high standards’. However when we unconditionally love and accept ourselves, other people’s opinions, whether positive or negative, become unnecessary. Let go of the fear of failure and the need to be perfect. Instead, embrace yourself and be fearless about putting yourself and your happiness first! My interpretation of this quote resonates with something I have witnessed happen with my feelings and emotions all of the time. I interpret this quote as saying that when we have those moments of great happiness, immense feelings of love and joy; we feel so elated and on top the world and in result feel indestructible. We assume those positive feelings and highs will never end once we have attained it. However, they do. It’s very easy to get into a trap of justifying and putting a label on where you are in life. This could be due to maybe feeling stagnant and without realising, looking outside of yourself to find a reason to feel happy, successful and loved. Another thing that gets brought into this mixture is beating yourself up about feeling bad. You know how to be happy and positive yet here you are feeling low. It’s as if you’ve let yourself down as you are not appreciating everything you have or you’ve somehow not used your abilities to their best potential. Those thoughts only make the situation worse, they are not beneficial and are useless. We have the power to change things and the first step is to focus solely on what you wish to see, feel and accomplish rather than looking back or at your current situation and not feeling good about it. Online, individuals have suggested that the meaning of the Carl Sagan quote is about time. The universe is timeless and limitless however we are in a time-space reality. Time is all an illusion as we only truly have this NOW moment. Our ego will think about the past and future and we rarely become mindful and bask in the current moment. Being unemployed for the past few months has resulted in negative thoughts creeping in such as “how will I explain employment gaps?”, “I’ve wasted time”, “There’ll be new graduates graduating this year, what have I done with myself?” I have forgotten my accomplishments and that life is fun and a journey. I have so much going for me and an amazing future ahead of me! Everyone has their own individual path and we are all destined for different things. Such feelings and thoughts of negativity can arise through comparison of yourself with others. It’s also a result of worrying what others think about you. This is your life, you don’t need to justify yourself to anyone and whoever is worth your time will recognise you. I am so blessed to have family and friends who always support me and love me, I must return that love to myself. I have let time discourage me. We don’t have to have a very busy and active life to be grateful for times of peace and relaxation. Boredom can get the better of us, I know it gets the better of me and so it results in me feeling demotivated and useless. We must know that life happens the way it’s meant to and this time out is just a part of the process. The best thing to do is not label it as anything such as “unemployed” or “trying to figure out my life.” Life happens and is always moving, stay positive and do not let circumstances outside of you rob you of your peace. Nothing lasts forever and everything is temporary including outside situations and inner emotions. This too shall pass. Never dis-empower or belittle yourself with feelings of “failure.” Know you are important and expect success. It’s the last day of 2012 and when I look back at this year and how much has happened; I feel immense liberation. This time last year I was in a relationship however I could tell it was coming to an end. I was in my final year of university and truthfully, I felt dissatisfied with life. I was depressed and would have to convince myself that I was happy however my mind and heart were contradicting eachother. I was definitely out of alignment. A lot of soul searching has occurred this year. The tipping point for me where the quality of my life really improved was in July this year. I finally felt that all of the pain and bitterness towards the split from my ex was gone. I loved myself and began genuinely enjoying life. Thereafter things just got better and better. I became a redhead in May which was actually accidental but nothing is ever really an accident is it ;). My red hair has become my identity and I love it! Everyone compliments it and tells me it’s my colour and I really can’t imagine myself going back to black or brown any time soon. I can honestly say I feel in top of the world and so strong right now. The final six months of this year, especially this past month have been so fun and fulfilling. I am so in love with life and myself. If you love life, it will love you back. I have learned so much about how important it is to focus on your desires and to enjoy life. I have a continuous feeling of contentment with life as well as excitement 😀 . I am very excited to see what 2013 will bring me as I’m filled with tremendous hope and know that the universe gives me everything I want in abundance. This message resonates with me very well. I believe that attachments to people and things hold you back and as you become so conformable with what you have, you lose the spontaneity to do exciting things and progress in life. I believe that the perfect mate is someone who you can be spontaneous with and someone that you are so close to where you feel like yourself at all times. You can do whatever you want in life and achieve your ambitions without the fear of that person leaving you or hindering you in any way. Many relationships are restrictive without us realising. Sometimes we resist our true selves out of fear, fear that our actions will upset others. However we need to remember that our lives belong to ourself. The people we cherish will stick with us though whatever we wish to pursue. People who try to knock you down or hold you back are insecure and not people you want to surround yourself with. I’ve found that I’m at my happiest, most free and spontaneous when single and focused on loving my friends and family. The men that have come into my life have been good to me however it’s very easy to fall into the trap of compromising yourself for them which results in holding yourself back without realising. I have seen this with my friends and other girls. I’ve always been aware that I need a man as adventurous and as free as myself who I can have an amazing relationship with. You can definitely maintain your independence and pursue the life you dream of with the right person, however my main point is that it is very easy to become attached, reliant and comfortable in a relationship which can result in loss of ambition. Focus on yourself and trust that the right people will enter and stay in your life. Allow yourself to enjoy life and stop letting your attachments and restrictions hold you back from being your truest, most authentic self.